Thanks Clement. Already considered msgnetim basing for them, will probably use for all though. Can get sticky sheet magnet and cut to size. Not thought about basing the bugs yet but will address that problem when I do. Thanks for the help, will take all that advice. I have now purchased the Wong and Zipp crews plus McTavish and a Fate Deck... Awaiting arrival so I can paint them. Looking forward to it but not painted for years... lol. 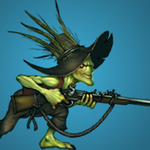 Hi all, I'm about to start playing Malifaux with the Gremlins Faction, specifically Ophilia's mob/gang. I'd like to know what I need to get hold of to be able to play, rulebooks, equipment and so on. Any help would be appreciated... Dheekon.